One of my favourite bloggers is Celia from Fig Jam and Lime Cordial and if you read my blog on a regular basis you will know two things for sure. The one is that I specifically thought of Celia when I made lime cordial, and that my sourdough starter Cordelia is named after her as Cordelia is the daughter of Celia’s starter. However, I did not think of Celia when I made this jam. I did however think of her as I typed the words fig jam into my title bar. After Dave and I had been at Grootbos we stopped off at Peregrine Farm Stall to buy some meat for a braai (BBQ). They had huge boxes of figs for sale as well as some small punnets. I resisted temptation and purchased only one small punnet with a few figs in it as I did not know when I would have the time to do anything with the figs other than eat them. A week later and they were still in the fridge and so I decided to make a fig and chocolate cake using my new Bunt mould. I had not even prodded the figs and expected them to be overripe and not good for eating. But as soon as I took them out of the pack I realized that they were too hard for baking with. I decided to not even try and soften them and sliced them up nice and thinly and put them into a frying pan. At this point I had no clue what I was going to do with the figs. And then I remembered the very quick jam I had made a while back. I was not sure if it would work with the figs but as I had nothing to lose really, I gave it a try. And wow, it made a great fig jam. Perfect to use as a condiment with cheese, and even better on some freshly baked bread! what is your favourite flavour of jam? I must make some again! Tandy, that does sound simple. I am not very flash at making jam. This method is so easy! I love figs with cheese, and that jam seems so easy. Might give that a go. How many jars does it make? 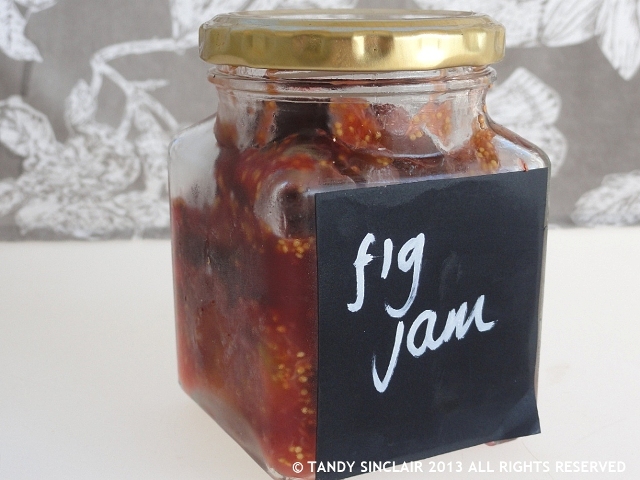 Fig sounds great Tandy, I never made fig jam… I love fig jam with cheese. enjoy your week as well! I have never had fig jam, and I love figs! My favourite would probably be raspberry. Food of the gods. Ha ha – I like that! I have to say fig jam is one of my favourites and I make it evry year. Sometimes I put slivers of lemon peel in it too – it helps with the setting and gives it a lovely tang! Oh, now I have to try that! Yum! Fig jam is definitely one of my favorite jams! I am going to try mine with some peanut butter! What an easy fig jam recipe! I love that you used honey in here! easy does it! Not very vegan friendly, but very tasty! Fresh figs have to be one of my favourite foods. I’d never had them before I moved to South Africa and now I buy them whenever I see them. I’ve never made fig jam though. I’ll have to give this a try as I can see it would be amazing with cheese. It doesn’t get quicker than this to make a jam. Sadly my fig tree is all but bare at the moment, not even a leaf to speak of. Tandy, your fig jam looks delicious! Truly. Fig is one of my favourites, but I also like strawberry as well as peach and passionfruit.